LightBox in use at the 2018 New York State Fair. We calibrated it to be a fun challenge and attraction for kids. 3 kids working together can do it. Fun, challenge and teamwork in action are the main benefits of our newest Pedal Powered Activity, the LightBox, an 8 x 8 Pedal Powered custom illuminated light sign that could be a hit for your org or company. Having a multi-person activity like the Light Box leads to genuine teamwork moments at your events. We’ve seen this so many times in our concerts that it got us excited to create a team light challenge. It’s visible from hundreds of feet, making it an attraction. As people get closer they’ll see the bikes and get excited to take a turn. Coaching it is easy. Just help the riders on and use your hands, voice or a PEDAL! sign to start each challenge. You’ll see people high fiving as they bring your name to light. Each logo requires its own individual creative approach to get the most from the available pedal power. For the NY State Fair we divided the classic I heart NY logo into its four letters/symbols, then wired each to one of the outputs of a sLEDgehammer circuit. When people pedal, more of the symbols turn on until they all enter a ‘party mode’ for a few moments. Then the game resets for the next group. Have you checked out our cooking show videos? Watch as experienced Pedal Power chef Kate Zuckerman of Brooklyn-based Sweet Cycle coaches audience members to process and then freeze ice cream custard with Rock The Bike’s Icycleta Ice Cream Bike attachment. Using a special mixture of natural thickeners, Zuckerman shows how to make delicious ice cream without egg yolks — easier and cheaper than french custard. 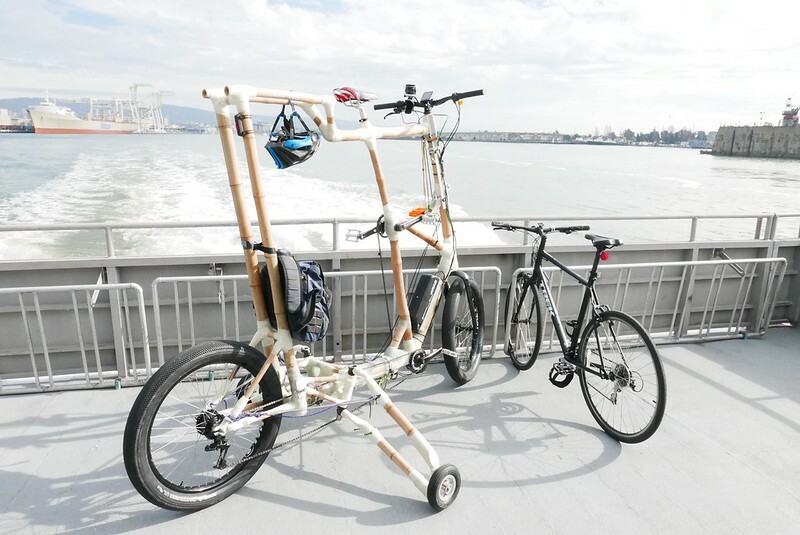 Pedal Power is an ideal match for ice cream — the slow speed doesn’t mix in too much air. Even kids can comfortably power the Icycleta Ice Cream Bike attachment. Learn to make some pesto with Rock the Bike’s owner, Paul Freeman. Catch up with him in the back garden of Rock the Bike with Edible Schoolyard showing off one of our High Performance Fender Blender Pros. Or make some Smoky Beetroot Hummus with Brittany. You can mix up this recipe using the Fender Blender Universale or the Fender Blender Pro. 1000 smoothies in 6 hours?! 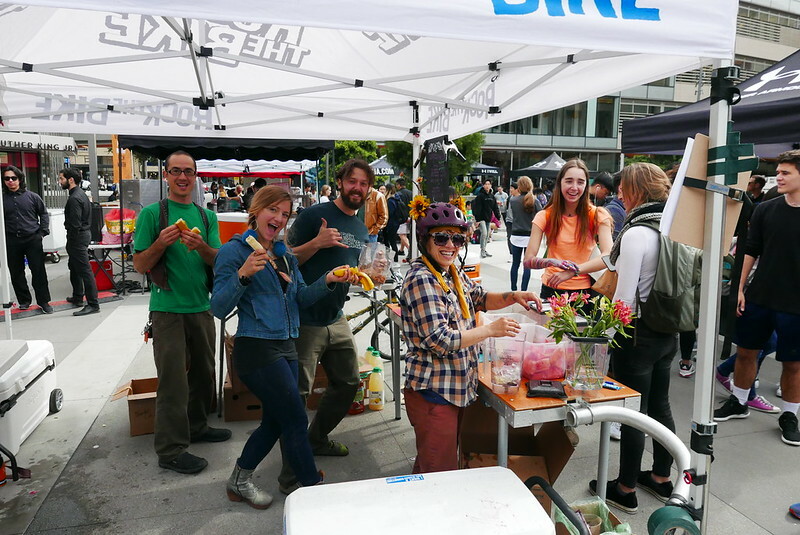 Occasionally we attempt a really big smoothie operation, in which we show up with hundreds of pounds of fruit, ice, juices, etc., and get lots of people bike blending. – Other kitchen gear: tent, tables, washing system, banners, waste system. – will you be sampling (giving away the rest of the pitcher)? Or will each person blend their own smoothie? Last Wednesday we did a big gig at the Cal Campus in Berkeley. The client / partner was Under Armour and their event firm Engine Shop. The goal was 1000 smoothies in 6 hours with 10 Fender Blender Pros. We nearly hit the goal. We got a lot of things right and learned a lot too, and here’s a report of all that. We showed up with a fully packed van at 8:30AM for an 11 O’Clock start time. Unloading with 4 people took 30 minutes, including positioning the bikes. By 9AM we were up to 5 people. With this size group we were able to set up the entire smoothie booth operation in 2 hours with time for coffee! I planned on having a crew of 5 at the peak, but this wasn’t enough. We really needed a crew of 7. The event provided us 1 coach and our crewmember Caleb came on as a floater midday, to bring some things we forgot from the shop, and to help with the lunchtime rush. He stayed till the end. We had an experienced crew. Only their staffer was a newbie. Rock the Bike has rocked events around the Bay Area with our message of pedal-powered revolution. We’re ramping it up – for the first time, people who take their daily spin class will wire back the energy generated by their workout into their electrical grid, helping to power their work place as they get inspired to bike towards a lower carbon footprint. We’re stepping up our giving and pro bono work more than ever before. Below is a rundown of what we’ve been up to lately. Thank you to all our customers; your purchases stabilize our operation and make this kind of direct social impact possible. Paul and the BooLander recently rode the Climate Ride Death Valley, and used his network of friends, fans, and RTB fans to raise over $3600 for Climate orgs. Paul pitched in $1400 of that, covering the ride costs. Fundraising is still open! What’s up bicycle customizers, feast your eyes on the BooLander, the latest custom bike to hit the streets at Rock The Bike. CNN sent journalist Sara Sidner to Standing Rock in North Dakota, though they don’t identify which camp they visited: Oceti Sakowin Camp, Rosebud Camp, or Sacred Stone Camp. In summer 2016 we supported and rode with the Pleasant Revolution bike music tour of the West Coast. Here’s an interview in which Kipchoge Spencer, the founder of the Pleasant Revolution, asks RTB’s founder Paul Freedman ( a.k.a. Fossil Fool) about the experience. The photos are Paul’s. KS: What made you want to join the tour? PF: I’ve been taking myself on increasingly long summer bike tours for years and have always found it to be a high point of the summer. I knew I wanted to join for week or more when I heard about it. Just to be on bike tour was my main motivation. I also wanted to back up their purchase of our pedal powered gear. KS: How long did you ride, days/miles? From where to where? PF: I joined the crew on Salt Spring Island in British Columbia—they were already on tour. I met them at the Farmers Market when they were setting up for a Biketopia Music Festival. I stayed with them for two weeks, until Seattle, and then joined them again on the Sonoma coast of California for another stint. 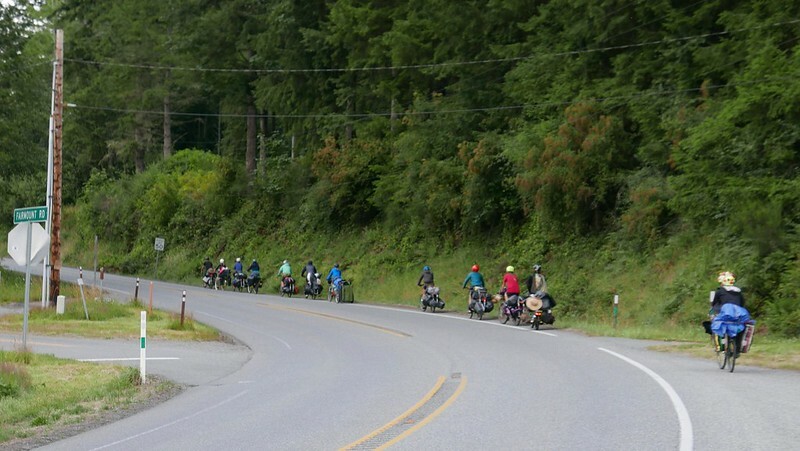 I think our biggest day of riding was 50-55 miles approaching Seattle. I felt it on the train ride home, I could barely walk! I always like combining public transportation with bike touring. To meet up with them the first time, I took Amtrak to Seattle, a ferry to Victoria, B.C. and then biked from there to the Salt Spring ferry. The second time I was able to take a bus from San Francisco to the coast to meet up with them. KS: You’ve toured with the Pleasant Revolution before, in 2010 in Spain. Except for Heather Normandale, one of the artists, this was a completely different crew this year. How did this one compare to the Pleasant Revolution that the Ginger Ninjas led? PF: Two of the main differences were the consensus decision making process and the stated goal of it being a women led tour. (Although that seemed a little contradictory—being consensus on the one hand but “women led” on the other). In Spain I had seen you leading the tour and everyone else playing their supporting roles. The level of difficulty seemed lower this time to me on the parts I was on. But that’s not a fair comparison because when I joined in Spain you were in the heart of the Pyrenees and had been riding for months. There were a lot of first time riders, folks who’d never been on a bike tour before, who began as musicians much more than bike riders. A really strong value was that the tour be a group uplifting process. It was more nurturing and focused on empowerment of every rider. 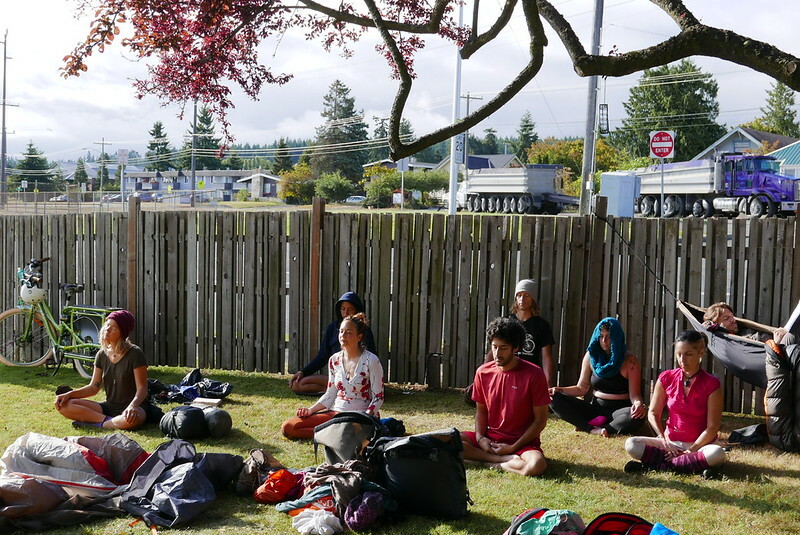 Daily meditation practice in Port Angeles. Note the huge logging truck! I felt that in the participation at the shows, where there was a strong value that everyone should have a voice and a purpose. Like, for instance, there was a dedicated MC (Nate) and there were circus elements and clowning for non-musicians (Nicky and Mega). When I joined in Europe there were some particular days when I felt like it was a really athletic endeavor. Like the day we went probably 60 miles, mostly on dirt, through twelve pitch black old railroad tunnels and over a small mountain and I had lots of flats, too. That time I had a fully loaded cargo bike with sound equipment and group gear, and this time I had a pretty easy experience with a titanium road bike and very little group gear, since I knew the the tour had the load carrying bases covered without my help. Playing shows in North America was really different than Europe. More organizing and pre-planning was needed here, whereas we did more impromptu gigs in Europe where we’d just show up in a city square, set up and play. I think that was both because of the personalities on this tour and the laws. This crew didn’t want to get hassled or forced to stop playing and they did the pre-work to get permission and make sure it didn’t happen. KS: Favorite day of riding? PF: I had a couple. The favorite moment was moving towards Port Townsend, Washington in the evening, on the 20. Dusk ride toward Port Townsend. I volunteered to go in back because I had a strong taillight and we’d been warned about truck traffic on that road. The group was staying very tight, moving steadily up a 4 mile hill together. There were some big logging trucks that passed us; they were all pretty respectful but it was a big deal when we got passed as it took them a couple minutes to pass us all. During that time you’d hear them rumbling and you’d hear the group calling out to each other to stay safe. I was feeling the teamwork and the human powered nature of what we were doing, and the comparison to the fossil fuel and car culture directly to our left. Then the truck would drop out of site and we’d be riding through a quiet forest at dusk again. This latest video, shot by our friend and partner, Natan Lawson of Wheely Good Smoothies in Baltimore, shows how eight of our rental activities created a large cohesive space with a large exhibit at the recent Democratic National Convention in Philly. Where Can I Buy Rock The Bike Products Outside of the United States? If you are located outside of the United States, you can still order a Fender Blender Pro from us! However, perhaps you might want to check for an official Rock The Bike dealer near to you! Use our interactive map to find your closest Dealer.